In this book the English anarchist writer Geoffrey Ostergaard sets out to sketch the historical development of the concept of workers' control in Britain, to clarify and assess the significance of the concept, and to explain why, both in theory and in practice, the idea has met with such little success. this is a mostly interesting but peculiar book. 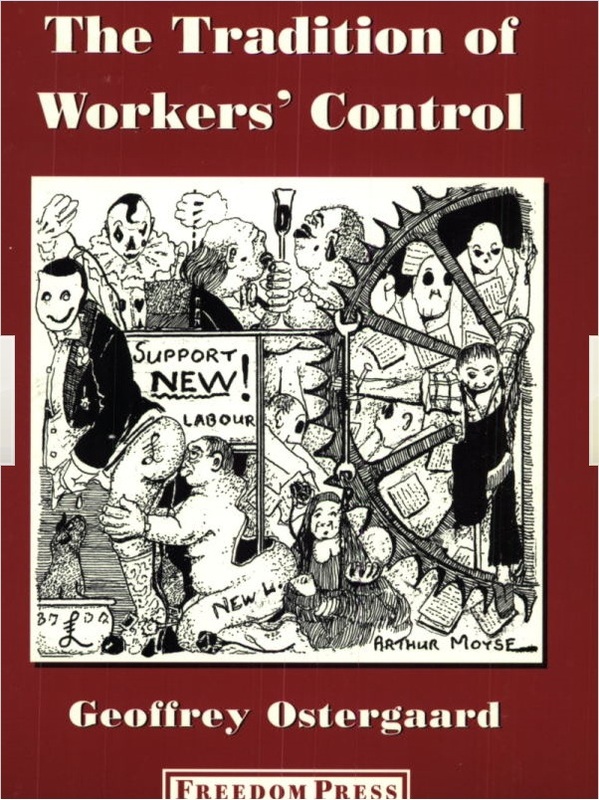 Started to re-skim the chapter "The Tradition of Workers Control" again. Just reading this again. I found some things in here about early syndicalism in the UK that I wouldn't know where to look for otherwise (as the author says the record is a bit scattered), and interesting comments on guild socialism. I found it interesting to see some debates, which we see in modified form today, being played out back in 1910. The "pure" syndicalists say "Anarchism... did not recognise howe the intricate structure of modern society demanded great organising capacities, scientific knowledge, economical insight..." (p. 41) , while the anarchists "suspected that the industrial unions might become unwieldy, bureaucratic and in the end tyrannical organisations,"(p.48). While some of this was resolved by anarcho-syndicalism there are still debates about how to achieve self-management on the one hand and efficiency (=lack of wastefulness) on the other, and whether one has to be sacrificed to the other etc. . As well as this, the place of the consumer versus the producer, and how to ascertain (let alone enforce) people's economic preferences comes up here. Ostergaard also writes about what he calls the new "managerial class," and idea he got from James Burnham. The comment from Syndicalist above says that this book is "peculiar", and it does seem weird that an anarcho-syndicalist is taking so seriously the proclamations of this Trot-turned-archconservative. Burnham argued that capitalists had been displaced from power under Nazism, and that New Deal America was seeing the rising dominance of managers as against owners, all this leading to the gradual rise of this managerial class and the end of capitalism not in socialism but a new class society called managerialism. From today's perspective he looks totally confused in analysis and prediction. Ostergaard thought it likely that this new class would gradually gain supremacy in the UK. Time has shown that that this wasn't right: moves towards nationalisation were turned back, and the rising importance of top levels of management in the corporations didn't actually signify a significant break with the power of owners anyway. Despite this, though, Ostergaard does manage to construct some interesting things from these dodgy materials. He proposes that the Fabian society, nationalisers and "collectivists" that influenced the Labour party in his day were driven by the interests and perspectives of a new class of bureaucrats, managers and experts. This argument is, I think, strong. He recognises the possibility of this class coming to rule but doesn't think it inevitable or impossible to fight, which also seems sound to me. Best of all, he gives a few good pointer's for a "new worker's movement" to avoid managerialism, especially to "devise means to ensure that [the expert] remains on tap not on top". These discussions in this book remind me a lot of the more modern ideas of participatory economics. There, the same class, called "co-ordinators", is taken seriously as a a possible ruling class. Also, the questions arise of how to have self-management along with the necessary level of organisation and efficiency, and how to balance the interests of producer and consumers. In other words Albert and Hahnel were concerned exactly with the questions which Ostergaard shows plagued discussions in early forms of worker's control in the UK, as well as other questions Ostergaard added himself about the managerial class. These questions were not plucked out of the air as they might sometimes appear, but came out of a long discussion on the libertarian left. I wonder what Ostergaard would have thought of their answers, e.g. "balanced job complexes" to directly prevent even the existence of the managerial class and the iterative planning process between federations of consumer and producer councils.